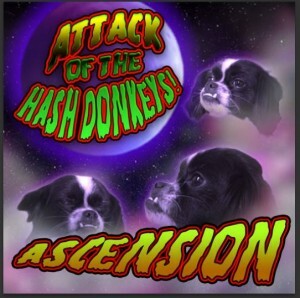 In an ongoing attempt to establish a unique approach to creating psychedelic music, Ascension hereby bestows upon thee a set of four fun full-on tracks entitled Attack Of The Hash Donkeys. In addition to music production, Ascension has been involved in many psychedelic music festivals in the Midwest USA, working with The Chilluminati and formerly SpaceCamp Psyfari. From the artist: “Many thanks go out to all those who got me involved in psytrance music and culture, my Chilluminati crew members, and everyone else who has supported my endeavors along the way or attended an event I was involved in! Huge thanks for the awesome cover art and awesome job mastering!” Mastering by Priapizzm with artwork by Zach Siens. MP3 Download | FLAC Download | WAV Download · Download count: 5,498. I love the cover art, so different from your usual stuff :) I’ll give the album a listen. This is a great album. I love the warm phat sound of the bass. Best album keep up the good work ! Really space sounding. Nice stuff seriously. This is soo good! So colorful! And in Colorado, like me! I’m in love with the cover art. Adorable pup leading the ascension cult.